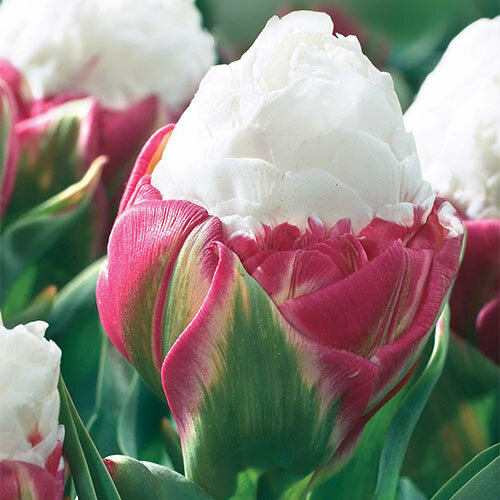 Tulip Ice Cream | Gurney&apos;s Seed & Nursery Co.
A one-of-a-kind Tulip! Flowers do not open completely which gives each bloom the impression of an ice cream. ColorWhite petals emerge from a base of deep pink petals. Blooms do not open completely giving the impression of an ice cream cone. BloomsLate spring for about 2 weeks, depending on weather; with other Tulips, Pink Buttercup, English Wood Hyacinths, English Bluebells. CommentsVery unique flower shape, not your classic tulip shape. It looks like an ice cream cone and when you see them you would like to take a bite from it. Its shape and coloring is very unique. It seems as if it has a fluffy mound of Vanilla on top ot Strawberry, decorated with a flash of lime. And it is all sitting in a cup with green emerald arms. When it was first introduced it cost a fortune. Luckily it is now available for a more reasonable price. It is one of the most unusual tulip flowers you have seen. Winner of the Trial Garden Award from the Royal Bulb Growers Association in 1999.